Why not have a recurring theme across all of your hen party merchandise? You can get this stunning design across a range of products, including sashes, gift bags, t-shirts and vests, to look perfectly coordinated. Decide on a colour and select the colour option in the dropdown menu for a preview of the sash. Once you've chosen a colour, you can then add personalisation to the front of your sash, and even to the back. The latter comes with an extra charge. Choose Hen Party Superstore for unique designs. Showing our 8 Hen Party Superstore Hearts Personalised Hen Party Sash reviews with an average rating of Excellent. Would you like to write a review? Such good quality and value for money. I ordered in deep pink and it’s just the same colour as on the site. Gorgeous. Ordered and delivered within a week which included a bank holiday! Absolutely delighted with quality, colour and cost! Will be ordering more for my Hen’s special weekend as this site got amazing choice. Thank you! Thanks for the personalised sashes. I would recommend this seller. Good product, super fast delivery and at a reasonable price. Ordered these for my friends hen night, great price and lovely product. Can't wait to see her face when she sees them. Review - We had 26 to be ordered, I called to see if I was able to send them a list of what I wanted on each sash and they were absolutely fine! Within a few days I had them turn up at my work. 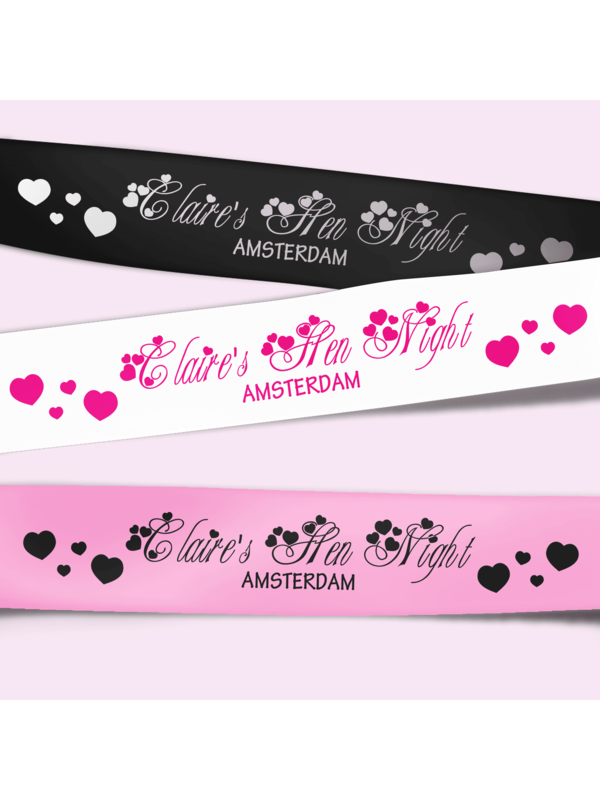 For around £5 you can't go wrong for a personalise sash! The quality of these are also spectacular I didn't know what to expect but the material is so soft yet sturdy! Can't wait to wear them in Feb! We had 26 to be ordered, I called to see if I was able to send them a list of what I wanted on each sash and they were absolutely fine! Within a few days I had them turn up at my work. For around £5 you can't go wrong for a personalised sash! The quality of these are also spectacular I didn't know what to expect but the material is so soft yet sturdy! Can't wait to wear them in Feb! Review - I was very pleased with the excellent service on my recent order. I was a little concerned as I couldn't see how to check my order before completion and was worried about spelling mistakes etc but they arrived the following day and are perfect. I was very pleased with the printing and quality and am just hoping the Bride To Be likes them when she sees them. Thanks again. I was very pleased with the excellent service on my recent order. I was a little concerned as I couldn't see how to check my order before completion and was worried about spelling mistakes etc but they arrived the following day and are perfect. I was very pleased with the printing and quality and am just hoping the Bride To Be likes them when she sees them. Thanks again. Review Title - They looked AMAZING! Review - When the sashes arrived, because I was ordering on behalf of the bride to be, I felt very anxious on opening the bag as I was praying that they would be perfect, and I was not displeased. They looked AMAZING! so elegant and beautiful, the hen do is next weekend and were going to look amazing! When the sashes arrived, because I was ordering on behalf of the bride to be, I felt very anxious on opening the bag as I was praying that they would be perfect, and I was not displeased. They looked AMAZING! so elegant and beautiful, the hen do is next weekend and were going to look amazing!